Founded in 1889, Lenox is renowned for its quality dinnerware and collectibles. It is still one of the most trusted tabletop names in the United States. The Lenox mission statement is to innovate, create, and execute. With such a storied history, it is no wonder so many people love Lenox collectibles. But those retail prices? Not so much. It may seem like a hard equation, but Delvage is the #1 solution! With our resale online shopping experience, you can find amazing Lenox collectibles at a fraction of their original retail cost. We have a large inventory of special collectibles, such as Lenox collectibles, Limoges, Lladro, Longaberger, Waterford, Wedgwood, and many more! Our wide array of collectibles will make for a happy home and even happier heart. Our stock of Lenox collectibles is updated almost daily with new and improved items for you to browse. When you register with Delvage, you have so many benefits. You are able to make product requests and we can send you an email when that item has come back in stock. Our wishlist feature will give you an update when a product you have had your eye on has been discounted to a price that you would like to pay! Is it time to declutter or downsize? Let Delvage be the one to sell your Lenox collectibles for you! No need to put in any extra work, all we need you to do is pick a price for the products you want to sell. We pick up your items and take them away – you never need to see them again! 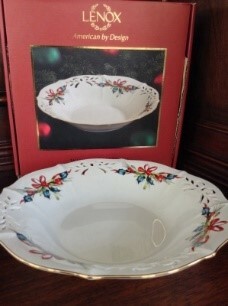 No need to worry either, we will photograph your Lenox collectibles, market them and take care of the shipping process, and you receive a portion of the items’ sales. It should be a crime to be this easy! We currently service parts of Connecticut through Virginia for pickups, and will be expanding to additional locations soon. To contact us call at 844-DELVAGE (844-335-8243) or email us at customerservice@delvage.com to learn more about our services and to schedule an appointment.